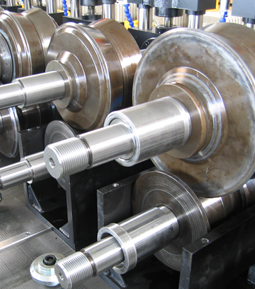 According to your requirements we can design and manufacture for you a roll forming line, roll forming tools and also refurbish your existing line. The line will be designed and manufactured in accordance with your requirements in respect to the number of roll forming stands required, and also the maximum strip width and thickness of the processed material. Our machinery is of modern design, powered by units with continuous speed control, the torque of which is transmitted through a system of gearboxes to the single shafts. Other equipment, for example punching, bending or cutting units are usually powered hydraulically or pneumatically. The entire system, based on the customer’s wishes, is controlled by automation at the level selected. The equipment is always designed precisely according to the customer’s requirements. This ranges from small single-purpose machines based on VS1, VS2 and VS5 platforms, to complex production lines with the classic design of roll forming lines.